Eminem has teased that his feud with Machine Gun Kelly does not stem from the rapper calling his middle daugther "hot as f***"
Eminem insists his beef with Machine Gun Kelly isn't about him calling his daughter Hailie "hot as f**k" in 2012. 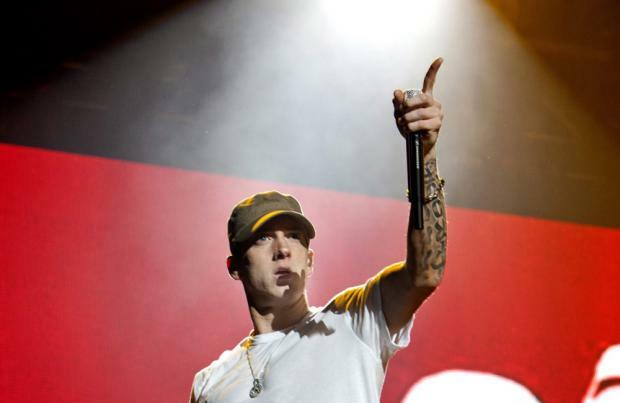 The 'Lose Yourself' rapper has teased that his problem with the 28-year-old star is "a lot more petty" than anything he's ever said about the 22-year-old beauty on Twitter, after he hit back with the diss track 'Not Alike' on his surprise record 'Kamikaze' last month. In the first part of a YouTube interview with musician Sway, Eminem - real name Marshall Mathers III - explained: "You know you go down the wormhole of YouTube and whatever, right? "So, that's not why I dissed him. The reason I dissed him is actually a lot more petty than that. Now I'm in this f***in' weird thing, because I'm like, 'I've got to answer this motherf***er.'" On the song, Eminem raps: "Now you wanna come and f**k with me, huh? / This little c**k-sucker, he must be feeling himself / He wants to keep up his tough demeanour, so he does a feature / Decided to team up with Nina / But next time you don't gotta use Tech N9ne if you wanna come at me with a sub-machine gun/And I'm talking to you but you already know who the f**k you are, Kelly/I don't use sublims and sure as f**k don't sneak-diss/But keep commenting on my daughter Hailie." Eminem is already back in the studio after MGK released his diss track 'Rap Devil' in response to 'Not Alike'. Kelly - whose real name is Richard Baker - admitted his rap battle with the hip-hop legend is a "battle between the past and the future". He said: "This is not a battle between Michigan and Ohio. This is a battle between the past and the f***ing future." Part two of the Sway interview, with the full explanation on their feud, is set to follow.